Thermage is a safe treatment that tightens and contours skin, with improvements in tone and texture that occur naturally through the stimulation of the skin’s own collagen. The procedure is completely non-invasive, with no surgery and no injections, with minimal downtime for recovery. In addition to its initial application for enhancing or rejuvenating facial features, the Thermage procedure can now be performed specifically to enhance and smooth the eyelids and areas immediately around the eyes. This procedure can also be implemented to restore fullness to the lips and smooth the skin around them, and to produce more youthful-looking hands. Unlike lasers, Thermage works on all skin types and tones, and unlike injections or fillers, it works on the entire face — forehead, eyes, nasolabial folds, jaw line, jowls and the area under the chin. Improvements are visible immediately, and can increase for up to six months. The procedure is generally performed in a single treatment -- with results that can last for years depending on skin condition and your own unique aging process. The Thermage treatment takes from 45 minutes to several hours, depending on the treatment area, using Capacitive Radiofrequency (CRF) technology to safely heat the the dermis and subcutaneous tissue, while applying a cooling spray to the epidermis. Results of Thermage treatment may include immediate tightening, and continuing improvements to appearance, tone and texture, with new collagen growth, for four to six months. 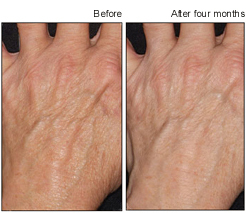 Hands by Thermage helps smooth and tighten the skin on your hands so that it looks brighter and more radiant and fine lines and wrinkles are smoother and less prominent. Hands look noticeably younger and more luminous. We are a medical and surgical dermatology practice, consistently among the most highly rated in Northern California. We specialize in all conditions of the skin, hair and nails, as well as in skin care evaluation and treatment and we’re experienced in treating patients of all ages. A doctor/patient relationship requires an in-person physical examination and review of medical history. The above information should not be considered a doctor/patient relationship. It is intended only as a general guideline and information with what is onsidered standard of medical care in the state of California. This information does not constitute the treatment or diagnosis of any disease. © 2018 All Rights Reserved, ED BECKER, M.D.